Fantastic Spacious traditional apartment in the East End of Glasgow. Completeley Refurbished Offers Around £84,999. Viewing essential. Spacious three bedroom semi detached property in Cardown, Near Stepps. Gas central heating, Double glazing. Fixed Price �95,000. One Bedroom Property in Glasgow City Centre to let, fully furnished to a high standard and walk in condition. Electric heating and DG. Offers Around �59,999. 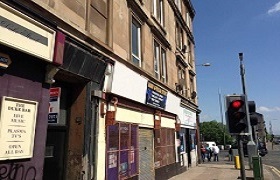 Large one bedroom tenement flat For Sale in highly sought after Duke Street, Glasgow. Completely refurbished building. Viewing is essential. Click here to contact us. TO LET - £475 pcm. One bedroom, main door apartment close to Glasgow City centre. Highly sought after so wont be available for long. Click here for schedule. NOW LET - One bedroom apartment close to Glasgow City centre. Available 1st October, 2014. Highly sought after so wont be available for long. To Let �525 Per month. Call 0141 552 8810 for details. Click here to contact us. NOW LET _ One bedroom apartment in Cowcaddens area near Glasgow City centre. Coming soon. To Let �525 Per month. Call 0141 552 8810 for details.